Congrats to our Peer Mohee on his Canadian citizenship! Home » Congrats to our Peer Mohee on his Canadian citizenship! 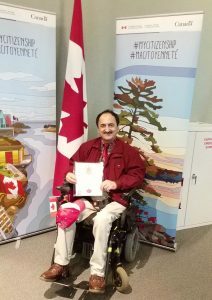 On December 15, 2018, I was honoured to become a Canadian citizen. It is a great privilege and I am excited to share my thoughts about one of the most significant events in my life with SCI BC and my Peers. I was born in Nowshar, Iran where I lived my entire life before immigrating to Canada. When I was 20 I was in an acrobatic maneuver with modified cars and one of my calculations went wrong. The car flipped, I broke my back and became paralyzed from the waist down. 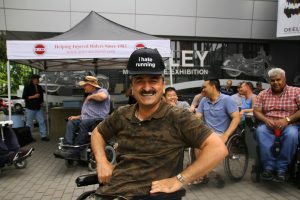 I have a T12-L1 spinal cord injury, but I was a little fortunate, as my injury is incomplete. Even in the worst situations your outlook can still be positive and optimistic and I’m that kind of person! After almost four years of rehab I started to think about my real life. I established my own business, an electro-mechanical service centre inspired by years of interest in an old hobby. I enrolled in university and earned my BA degree in Law, but it was not easy. There was no ramp, no elevator, no accessible bus or taxi. I mostly owe my success to my kind friends who would take me to the fourth floor to attend my class while sitting in my manual chair! After graduation I passed the Master’s degree entrance exam to enrol in a government funded university in Tehran. In order to get to school I hand control equipped my car and drove every one or two weeks for five hours through mountainous terrain on one of the most dangerous road in Iran. It took almost three years to get my MA degree in International Law. Not very fun, but a great challenge. However, my ultimate dream was still far away. Years before and after my injury I wanted to immigrate to a free and democratic society with western progressive values and laws. One of my favourite countries I heard about was Canada. After four years of the immigration process, I moved to Canada as a permanent resident in May 2013. I first landed in Toronto, Ontario. It was a physically new world for me but I already knew some of what was waiting for me. Months before moving I searched the internet for SCI societies in Canada and found SCI Ontario. I exchanged some emails with them and I participated in one of their events just two weeks after my landing! Life in Canada was super easy for me. There were accessible buses, taxis and trains. Most importantly, there were nice, warm and welcoming people. I found SCI BC on the internet and became a member before moving. I remember the first person I talked to was Kristen Sharp. I asked some questions and explained my intention of moving there and she told me that finding an accessible place is a great challenge. That became my main concern. I managed to find a place that wasn’t 100 per cent accessible but was almost enough for me. I participated in my first SCI BC event at Locarno Beach, the Multi-Sports Day, and I made many friends. It was a day to remember! SCI BC has had a great impact on my life. It has helped me find friends and socialize with people with common issues. It has been a source of information and it was a bridge to connect me with Canadian culture and a new society. I am very pleased to live here and choose Canada as my country. We all know the value of a country is not just based on its natural wealth and resources, but its people, and OUR Canada has some of the best people in the world.